UTech, Jamaica's Oral Health Training Impacting Jamaica — UTech, Ja. 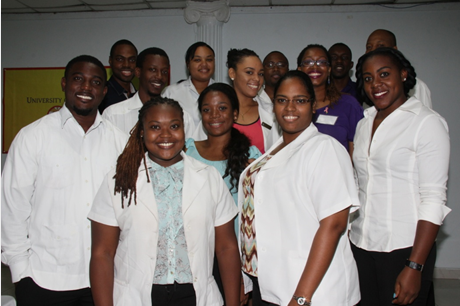 Happy Smiles: Members of the first cohort of the University of Technology, Jamaica, College of Oral Health Sciences Doctor of Medical Dentistry (DMD) course of study who will graduate at the University’s Graduation Ceremony scheduled for Thursday, November 12, 2015 at the National Arena in Kingston are all smiles at the College’s 4th International Scientific Symposium held October 15 -17, 2015 at Medallion Hall Hotel, Kingston. The College of Oral Health Sciences, University of Technology, Jamaica (UTech, Ja.) continues to advance its position as the country’s most comprehensive provider of oral health training at the diploma, undergraduate and graduate levels. The first cohort of twenty four (24) dental surgeons have successfully completed the five-year Doctor of Medical Dentistry (DMD) course of study delivered by the College and are set to graduate at the University’s November 2015 graduation ceremony. The dental interns will now move on to their mandatory one-year vocational clinical internship period with attachment to approved government centres in order to qualify to be licensed dental practitioners. The College of Oral Health Sciences offers the Doctor of Medical Dentistry, (DMD) Master of Science in Dental Therapy, the Bachelor of Science in Dental Hygiene, the Bachelor of Science in Dental Laboratory Technology and the Diploma in Dental Assisting. The courses of study at the College of Oral Health Sciences are of the highest international standards and are being delivered by a world renowned faculty of international repute, in teaching facilities that are among the best in the Caribbean region. The programme has attracted international students from the region including the Bahamas, Cayman Islands, St. Lucia, Trinidad and Tobago and Turks and Caicos. UTech, Jamaica’s Oral Health Sciences courses of study were recently under the microscope of the Commission on Dental Competency Assessments (CDCA) which administers the competency examination, ADEX-NERB. Based on the assessment of the high standard of the programme offered at the College and the exceptional competency level demonstrated by the students, the ADEX-NERB examination for the cohort of Doctor of Medical Dentistry students was administered at the College in May 2015. Dean of the College of Oral Health Sciences, Dr. Irving McKenzie notes with pride, that a 96% pass rate was attained following the sitting of the “very challenging examination administered by one of the world’s best competency assessment boards.” ADEX is a test development board serving member state dental boards in developing valid and reliable initial licensure examinations in dentistry and dental hygiene. Jamaica is the first country outside of the US mainland to become a member of the American Board of Dental Examiner (ADEX) organisation. Among the unique features of the UTech, Jamaica dental training programme is the extensive exposure of its students to knowledge and understanding of the full gamut of oral health diseases and issues, as well as the hands on experience gained through service and outreach both at the dental clinic located at the College’s Arthur Wint drive campus and health fairs conducted across the length and breadth of Jamaica, particularly in rural underserved areas where many persons have never seen a dentist in their entire lives. Over two hundred (200) patients receive treatment daily at the College’s Arthur Wint Drive oral health clinic and thousands of Jamaicans have benefitted from more than one hundred health fairs valuing millions of dollars. UTech, Jamaica’s College of Oral Health Sciences has been able to provide ongoing charitable support to Jamaicans in need, through a number of partnerships built up over the years with local organizations such as Food for the Poor, CHASE Fund and international organizations such as Great Shape Inc. and a host of individuals who provide equipment, their time and other resources. Over the past five years UTech, Jamaica has partnered with Great Shape! Inc. – a USA based non-profit charitable corporation under the 1000 Smiles Project. Students in years 3 to 5 of their course of study, under the supervision of faculty and licensed dentists from the United States and Canada, provide dental care at clinics set up to serve communities across the island. The Dental Prosthetic Laboratory established in January 2015 at the College of Oral Health Sciences, Arthur Wint campus has added another significant dimension to the service and outreach capacity. The first of its kind established at any oral health training facility in Jamaica, The Dental Prosthetic Lab has been set up with the support of Great Shape! Volunteers Bob and Dr. Sonja Irlbeck working along with members of faculty, staff and UTech, Jamaica’s Dental Laboratory Technician students. The Lab has been set up with state-of-the art equipment comparable to the best of such facilities in the world and has provided several complete removable dentures and partial removable dentures to patients free of cost through the Great Shape! Mission in rural Jamaica. The competent authority for entrance to the dental profession in Jamaica is the Dental Council of Jamaica. The College of Oral Health Sciences was recognized by the Dental Council of Jamaica in accordance with the Dental Law of 1972. It was also evaluated and recognized by the Commission on Dental Competency Assessments (CDCA) in June 2014. The CDCA is an independent international competency assessment agency for ensuring that the highest standard of dentistry is maintained. The Dental Council of Jamaica is currently a member of the CDCA and recognizes this exam in licensing candidates for local practice. In this regard, on successful completion of the CDCA examination, UTech’s graduates will be eligible to be licensed by the Dental Council of Jamaica and by various states in the USA. UTech, Jamaica is committed to all processes of relevant accreditation for all of its courses of study and intends to meet every accreditation standard required for its Oral Health courses of study. The College has established a highly qualified accreditation team which is currently engaged in the self-study and other internal processes in preparation for having its courses of study accredited. During Oral Health Month being celebrated in the month of October, students and faculty at the College of Oral Health Sciences will participate in several dental clinics focused particularly on the needs of the disabled community through partnership with the Jamaica Autism Support Awareness (JASA) and Brothers for the Poor. The College hosted the annual Caribbean Institute for Strategic Planning and Research in Oral Health Symposium from October 15 – 17, 2015 and its Annual White Coat ceremony for the Doctor of Medical Dentistry year three (3) and Dental Hygiene year two (2) students will be held on October 28. The College will also engage in an “Oral Cancer Walk” on Saturday, October 31 to bring focus to oral cancer disease. 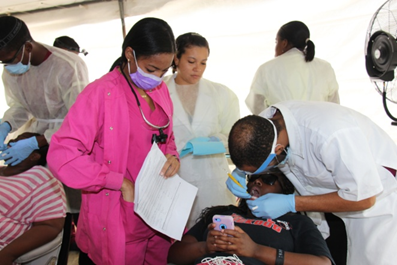 College of Oral Health Sciences students attend to patients receiving treatment at the College’s “Campus Smiles” dental health clinic hosted at the Caribbean Sculpture Park, UTech, Ja. Papine campus on October 13, 2015.